If you’ve never been to an Alamo Drafthouse, I do recommend it. Outside of a great movie/dining experience, they have a “no talk or text” policy. One in which, after one warning, you get kicked-out without a refund. With that policy comes some great PSAs. 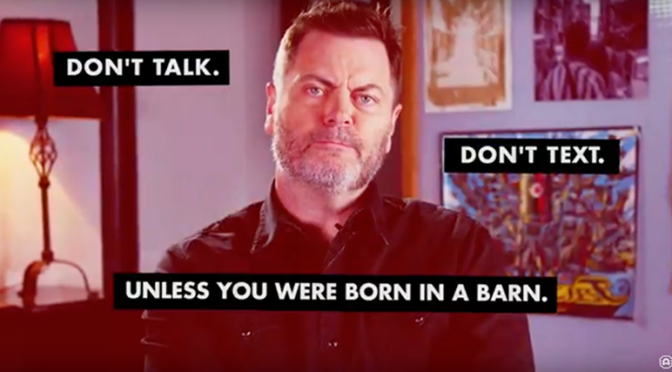 The latest comes from Nick Offerman, currently starring in HEARTS BEAT LOUD. Check it out below! So remember, unless you were born in a barn, turn that phone off & enjoy the show! Previous PostExperience the ‘BAD TIMES AT THE EL ROYALE’Next Post‘LUCIFER’ Returns from the Abyss of Hell!